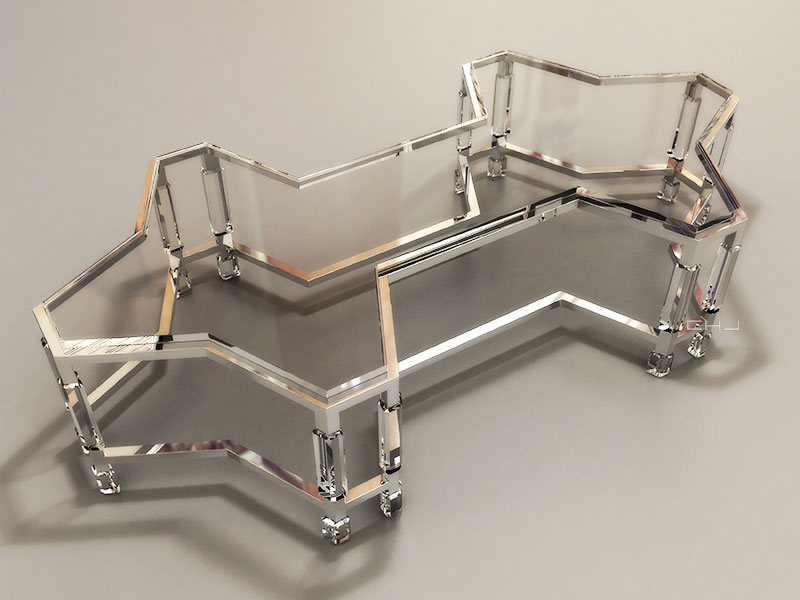 The Connexion Rectangle Starr Coffee Table is part of the Connexion Line. The Connexion Line was created out of a relationship Charles originally had with a girl. When things didn’t work out he began drawing pictures of things he wanted to gift her, they never really in the end connected with her but ultimately became very connected with his work. The philosophy behind this line is to create things that go together and connect in life, especially in furniture so people wouldn’t have to buy multiple pieces with no relationship. The Connexion line is also sensitive to collectors who want to buy furniture — they could easily own a collection of work, as most of the line ranges between 2-6 pieces. Charles thinks of this line very much so as art, and saw an opportunity to improve on the relationships of many pieces of furniture in one room. Additionally, Charles’ focus was to showcase that one could own multipurpose furniture — it could be pieced together to make a statement as well as separated and enjoyed individually. This line is only available for purchase directly through Charles Hollis Jones.